Akshaya Patra received the coveted Quality Mark Award for Achievement and excellence in the NGO segment for the year 2015! The Foundation's Gujarat team received this award on 10th May at an award ceremony held by the Quality Mark Trust at the YMCA International Centre in Ahmedabad. The awards are aimed to encourage and support excellence among organisations in their respective fields. The awards this year saw the participation of several reputed MSMEs (Micro, Small and Medium Enterprises). The finalists in the contest were selected after a rigorous series of interviews and quality audits conducted by panel members from the Quality Mark Trust. 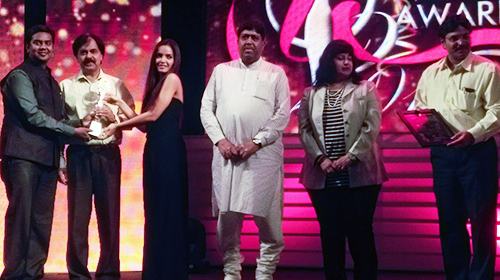 Presenting the award to Akshaya Patra were the Honourable Minister of Cabinet, Government of Gujarat Dilip Sanghani; Director CED, Dr. Chandan Chatterjee and Bollywood Actress Shazahn Padamsee. Also present were Honourable Minister of State for Home Rajnibhai Patel; Honourable Minister of State for Tourism and Water Resource Jayeshkumar Radadiya and Bollywood actor Sunil Shetty. Receiving the award on behalf of Akshaya Patra were Kaushik Pandya, General Manager (HR), Gujarat Region and Amrit Ranjan Sahoo, Deputy Manager (Operations). The Quality Mark Trust was established in 2013 by members in the field of quality, environment, health and safety management systems in India, to honour individuals and organisations that have dedicated themselves towards providing quality products and services to the society.